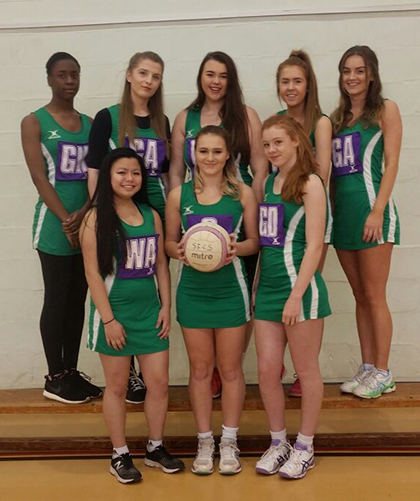 The Netball Team at The Sixth Form College, Solihull are celebrating a great season, which saw them finish as runners-up in Under-19 Solihull School/College Tournament and achieve fourth place in the AOC West Midlands Under-19 Netball League. Player of the year has been Hannah Wilkinson (aged 19, from Bentley Heath), for her continued commitment and motivation to the Netball Team over the last two years, both in terms of training and match availability. She has developed as an individual player and has been chosen to be captain this year due to her leadership skills and qualities, including being a role model to the whole netball squad. She demonstrates flexibility in her approach to games to help the team win by stepping into various playing positions. The full squad consists of Hannah Wilkinson, Georgia Townsend, Katie Preece, Hannah Maddams, Stephanie Lowe, Jade Moles, Molly Bolton, Vicki Jones, Olivia Dance, Faith Drayton, Joanne Humphries and Dieu Huynh. This success follows hot on the heels of the Football Team winning the ECFA West Midlands Under-19 League. The College also offers students the opportunity to play rugby and basketball.